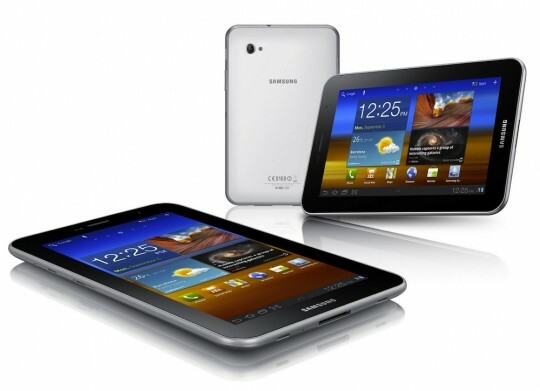 Samsung has revealed a new 7-inch Android 3.2 Honeycomb tablet, the Galaxy Tab 7.0 Plus, seemingly targeting a cheaper price point than the recent Galaxy Tab 7.7. Packing a 7-inch LCD IPS display running at 1024 x 600 resolution (rather than the Tab 7.7′s Super AMOLED HD 1280 x 800 panel), the Tab 7.0 Plus also offers triband HSPA+, WiFi a/b/g/n (2.4/5GHz) and twin cameras. On the back there’s a 3-megapixel camera with autofocus and an LED flash, while a 2-megapixel camera is on the front for video calling. Inside there’s Bluetooth 3.0, WiFi Direct and WiFi Channel bonding support, USB 2.0 and USB Host, and a microSD card slot to augment the 16GB or 32GB of onboard storage. It’s 193.65 x 122.37 x 9.96 mm and weighs 345g. Power is courtesy of an unspecified 1.2GHz dual-core processor, paired with 1GB of RAM, and there are the usual proximity, accelerometer, digital compass, gyro and ambient light sensors. On top of Honeycomb, Samsung’s TouchWiz interface delivers its media, social, ereading and other hubs, together with some custom widgets and software like Kies Air. No word, at this stage, on exactly how much the Samsung Galaxy Tab 7.0 Plus will cost. The company says it will land in Indonesia and Austria first, at the end of October, before seeing a progressive roll-out globally including Southeast and Southwest Asia, US, Europe, CIS, Latin America, Middle East, Africa, Japan and China.